Fishermen in Burgos town, Surigao del Norte, found 40 bricks of what police suspect to be cocaine floating near the shore Sunday. BRUTISH BRICKWORK. 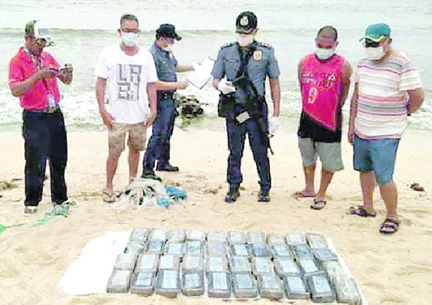 Tape-wrapped bricks, similar to cocaine cubes found in two Surigao provinces and other areas, are floating near the shoreline in Burgos, Surigao del Norte Sunday, have been turned over to the police crime lab and the Philippine Drug Enforcement Agency for testing. The tape-wrapped bricks were labeled “3B Bugati,” similar to cocaine bricks found in Surigao del Norte, Surigao del Sur and other provinces on the eastern seaboard, police said. The bricks, weighing about a kilo each, were turned over to the police crime lab and the Philippine Drug Enforcement Agency for testing. If they turn out to be cocaine, the bricks would be worth about P212 million, police added. Meanwhile, Metro Manila police chief Guillermo Eleazar said his men and members of the PDEA conducted a joint anti-drug operation in Sampaloc, Manila and arrested three men, including the 39-year-old head of the syndicate. He said police raided apartment 1817-C Algostro Building along Simoun Street in Barangay 484 around 12:45 a.m. where they seized 516 grams of metamphethamine hydrochloride, locally known as shabu, with street value of P3.5 million, one firearm, a handheld radio, and drug paraphernalia. The suspects—Porferio Pementera, leader of Pementera Gang; and Orlando Naguinlin, 56, are now detained and undergoing interrogation at the police headquarters in Camp Bagong Diwa, Bicutan, Taguig City. A barangay watchman identified as Joseph dela Cruz was also arrested after allegedly trying to impede the police operation. Eleazar said the recovered pieces of evidence were brought to National Capital Region Police Office Drug Enforcement Unit and will be examined by the PNP Crime Laboratory Office. Eleazar said the Pementera Drug Syndicate is operating in Manila and Quezon City. He added the gang is connected to local narco-politicians, including a former barangay councilor Ronnie Labongray, who died during a police operation on March 28. “Furthermore, they are also connected to high value target ‘ninja’ cops engaged in drug trading activities particularly Jolly Aliangan, who is currently detained in city jail,” he said. In a forum last year, PDEA officials said drug syndicates are operating in cahoots with government officials, law enforcers and community leader. They said shabu; marijuana and the party drug Ecstasy manufactured by Chinese, Taiwanese and Mexican drug syndicates are the top three narcotics distributed on the streets. President Rodrigo Duterte had also disclosed that 40 percent of barangay officials are linked to illegal drugs or directly involved in drug dealing and trafficking. Since July 2016, at least 39 village chairmen and 53 village councilman have been arrested due to involvement in illegal drugs. Authorities suggested a target of 30 percent of barangays must be cleared yearly with the hope of eradicating the drug menace in four years.